A trip to Australia cannot be complete if you did not experience the rush of seeing native marsupials for the first time. 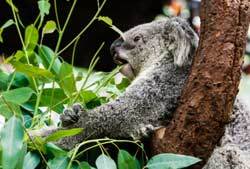 Brisbane’s acclaimed Lone Pine Koala Sanctuary is more than equipped to provide you a beautiful adventure of not only seeing but also interacting with them up close. Experience the outback farming presentations, unwind in the lap of nature, and cuddle a Koala â a complete hand-on encounter at this official Guinness Book World record holder sanctuary. The spacious courtyard looks like something out of a magazine on traditional outback ranches. The glorious setting is just right for the peace you come seeking. However, you can still remain discreetly connected with civilization with free Wi-Fi Internet access. The site has custom designed presentations on the authentic Australian outback experience. This includes sheep dog shows, and the sheep shearing is an interactive activity and is scheduled minimum thrice every day. However, the ultimate element of the Lone Pine is of course the Koala forest. A huge enclosure surrounding the sanctuary holds 130 protected Koalas. Female Koala bears like Bertha and Crumpet are extremely accustomed to interacting with visitors every day. Get to the sanctuary early to see the entire place come alive with koalas jumping from tree to tree in their innate hurry to start feeding. You can cuddle free but before you start taking you digital device snapshots, you have to pay a small fee for a souvenir photo. This fee is used as a fund collection for further research and maintenance of enclosures in the sanctuary. 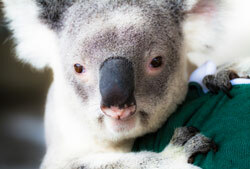 Added attractions include feeding and petting the Kangaroos in the kangaroo reserve. The âBirds of Preyâ is a unique flight show. The rainbow Lorikeets are lured to the sanctuary with special nectar meals which, you can feed them under guided supervision. Check out the newly added Platypus in the collection, probably residing in one of the costliest home in the sanctuary. The Lone Pine is opened every day from 9 am to 5 pm the whole year round. The only exception to this rule is April 25th each year when the sanctuary opens at 1:30 pm and closes at the usual 5 pm slot. The entry fee includes a complete access to all the shows â rainbow lorikeet feeding is scheduled at the beginning and end of each day(twice), Koala presentations (12 pm and 2 pm), Platypus presentation (2:30 pm), Sheep dog and Sheep shearing (10:30 am, 1:30 pm and 3:30 pm) Wildlife encounter- fur and feathers (11:30 am), Scales and tails presentation with snake and crocodile holding at (1:30 pm and 1:45 pm). Prices are set at adults $32, children (3-13 years) $22 and concessions for students. Family prices can be in the range of $52 to $80 approximately. One of the ways you can get to the sanctuary is via the Mirimar riverboat cruise. However, hiring a mini minibus or a coach is by far the best option for a group travel arrangement. The sanctuary is situated just 12 km away from Brisbane city. We can arrange transport for groups of any size to the Lone Pine Koala Sanctuary, please call or send us an email for more information.